Understanding where a buyer is on their journey is invaluable. Have you considered using search terms to gauge your buyer’s level of interest and intent? How much consideration do you give to search and SEO as key influences in your buyer’s decision making process? Pardot.com reports 72% of buyers will turn to Google when researching products and solutions. What are the implications – and opportunities – for B2B marketers? With search being a primary driver of contact acquisition and inbound inquiries, aligning and optimizing the right content to search terms used along the buyer journey can improve both the buyer’s experience and your conversion rates. In this article, we’ll show you how best to plan and align keyword strategies to your audiences’ buyer journey stages, as well as advising on the best types of content to have in your arsenal to attract and convert searchers. Beth Morgan, an online marketing professional who writes the Marketingnerdistry.com blog, developed a classification of keywords aimed at identifying the intent of B2C customers. We’ve taken Beth’s theory and applied it to the B2B buyer journey. Morgan classifies keywords as Audience, Substitute, Complementary, Competitor, Product and Branded terms. 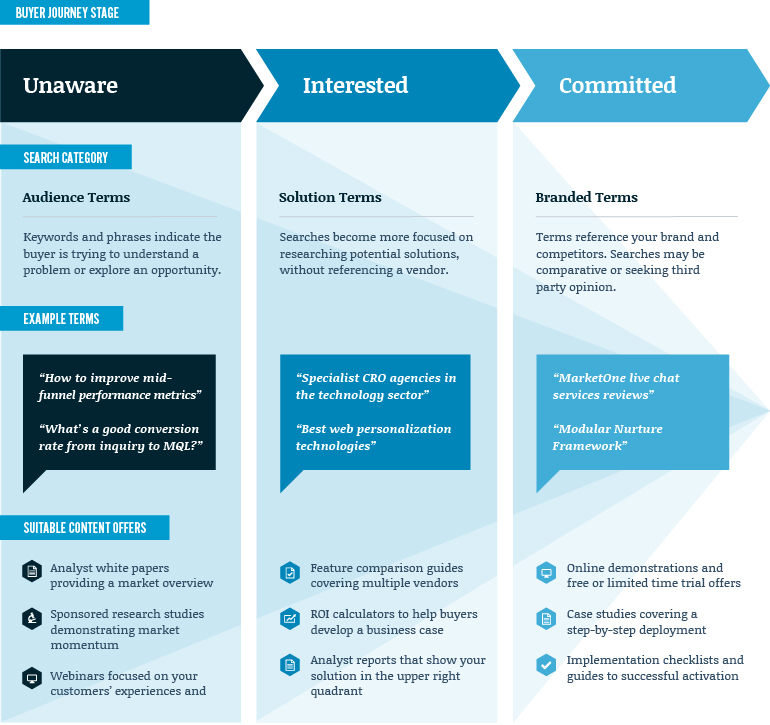 For our B2B application, we’ve streamlined this into three categories that align to the pre-purchase stages of the buyer journey: Audience Terms; Solution Terms and Branded Terms . Being able to predict a prospect’s intent based on their use of search terms enables us to present the right content at the right time, giving us the optimal chance of converting unknown visitors to known contacts, entering them into a relevant automated engagement program, or even routing them directly for telequalification. People searching on these terms are generally in the early stage of their buyer journey. Their interest has likely been triggered by the recognition of an internal deficiency or an external opportunity, however, there is still uncertainty around how best to proceed. Keywords or phrases at this stage are less focused on the solution and more on trying to get a better understanding of the problem or exploring how to capitalize on the opportunity. The language used tends to be broad, search phrases are longer and may often be phrased as a question. As you would imagine, people using such phrases are less likely to make an immediate purchase. Suitable early-stage content in conjunction with a well thought out data capture strategy – potentially using progressive profiling to minimize fields and lower the barriers – gives you the best chance of making a conversion. Once acquired, prospective buyers may welcome assistance with their initial research efforts, so feed them into an automated engagement program offering supplementary resources. Don’t be afraid to make an early telequalification call – but with the goal of better understanding their needs and establishing fit, rather than finding an immediate sales opportunity. People at this stage are aware of their pains, or keen to pursue new market opportunities, and are actively seeking a solution. They have an idea of what is needed to fix the problem but are not yet aware of all the vendors offering solutions, the core features to prioritize, and the cost-benefit criteria they should consider. Search engine results pages (SERPs) will likely present links to both you and your competitors’ solutions, as well as third party independent reviews and forums where past and/or current customers reveal their views. The latter generally tend to have a disproportionate influence at this stage, so what can you do to ensure your brand and solutions are fairly represented? Write or commission articles and syndicate them on influential industry sites with search authority to boost your SEO scores and overall ranking for targeted keywords and phrases. Ensure that any links from these third party websites direct to a landing page on your site that’s geared towards meeting the information needs of searchers at this stage. Leverage the credibility and authority of relevant networks by actively engaging with them. You can’t completely control the conversation, but you can quickly correct misperceptions, tactfully introduce advocates, and steer people towards useful tools and information across your website (this also helps with your back-linking strategy). Contacts responding to these offers should be immediately entered into an automated engagement program to nurture their interest and influence decision making criteria in your favor. Account-based scoring may well reveal further interest and engagement among other influencers and decision makers within the same company. If there is no immediate conversion and the searcher remains anonymous, use ad retargeting with similar offers to keep your brand and solution front-of-mind. People searching on these terms are aware of your brand and possibly the specific solution you offer. As always, context is important here. Look for phrases that include mention of reviews, suggest a vs./versus vendor comparison, the implementation process, support capabilities, maintenance agreements, and the financial and investment implications. Such phrases would indicate the buyer is in the later stages of their decision making process and your solution is within the consideration set. But also consider targeting similar phrases mentioning the brand or product names of your competitors – it may not be too late to get your brand into the picture. First and foremost, content and offers should be designed to satisfy buyer search intent. However, at this stage it becomes more important than ever to offer clear and easy opportunities for prospective buyers to “raise a hand”. You may also wish to proactively open a chat window on these landing pages, offering assistance. Whatever you do, don’t make it hard for the buyer to engage and ensure you give them a clear path to purchase. Attempt to contact buyers responding to these offers immediately. Use their preferred channel of communication if they’ve indicated one, otherwise by any and all means possible. The primary goal of any conversation should be to confirm their interest and facilitate an appropriate next step – don’t appear presumptive and expect to close the business there and then. It may be that they are still in the very early stages of their search and passing them to Sales as a hot lead would be premature. In conclusion, don’t plan your search strategy in a silo. Think of it as just one element within your integrated buyer journey framework alongside your content strategy, data capture and form strategy, retargeting and lead nurturing programs. Integrated engagement is essential to facilitate and accelerate the sales process. MarketOne converts casual browsers into committed buyers by connecting conversations, across channels and over time. Initiate a chat now to find out more.